Residents of the remote Isle of Colonsay are making a final bid to secure the tower of their Georgian church. In the space of a mere six months, the renovation committee on the island of just 135 people has managed to raise £57,000 of the £60,000 repair bill, leaving £3,000 as the last link in the chain. The remaining £3k funds, however, must be in place before the end of June, so it is a race against time to make ends meet. "We have worked very hard to secure funding," said Kevin Byrne, the church's session clerk. "And we are overwhelmed and immensely thankful by the support we have had from both islanders and donors from across the world, as well as generous grants from a number of bodies. "But we now need £3,000 to complete our work - it doesn't sound like very much, but when you haven't got it, it can seem like a mountain to climb." When the tiny congregation discovered that the elegant 1802 church belfry was in imminent danger of collapse immediate action had to be taken, on grounds of safety. The church is a listed building, so no short-cuts were possible and the total estimates came to £60,000. In a leap of faith, the work was commissioned in December 2016, despite a complete lack of funds. All but two dozen of the 135 inhabitants are either children or pensioners, but the tiny committee launched an appeal and have since been almost overwhelmed by the response. A total of £22,000 was granted by the combined generosity of the National Churches Trust, the J. Murray Napier Fund of St. Columba's Church in London, the Allchurches Trust, the Baird Trust and the Garfield Weston Foundation; in addition it is hoped that HMRC will refund the VAT. Private individuals worldwide have also flocked to the cause, including descendants with Colonsay roots going back 200 years or more. Some donations have been made via a Just Giving site ( https://www.justgiving.com/copc ) , others have been made direct, and were boosted 25% by means of GiftAid ( Charity SC031271), whilst other supporters have contributed in kind. Rare books were sent from Toowoomba in Australia, and successfully sold; artists and craftspeople from Scotland and overseas have contributed original works to an exhibition, for sale in the island and online ( http://www.colonsaychurches.org/text/Exhibition%20Catalogue.htm ); even the contractors, Rowan Stoneworks, have helped most generously. 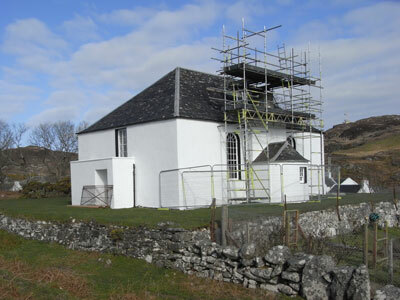 All islanders have given of their time and energy and in a fine ecumenical gesture the island Baptist congregation have given unstinted and invaluable support. "Colonsay boasts a Christian tradition that pre-dates Iona, and an association with no less than nine of the early saints," continued Kevin. "It is an ecumenical community, and the parish church is closely identified with thousands of emigrant families across the world. "The church is always open and welcomes all-comers. We have a duty of stewardship, to ensure that it is fit for future generations, and are most grateful for all help. Regardless of that, parishioners extend a warm welcome to the world - please join us at worship in Colonsay." Details of a special appeal are posted at www.colonsaychurches.org and the church is a registered charity SC031271 eligible for Gift Aid. The island was at the centre of controversy when residents voted to welcome employment opportunities offered by fish-farm operator Marine Harvest (see HeraldScotland, 1 April 2012). The parish church was built in 1802 at a cost of £444.15s.2d and is notable for its elegant classical design, and for a very fine coombed vernacular wooden ceiling. "There is a blind oculus immediately above the vestry, and the pediment is surmounted by a simple bird-cage belfry with ogival-topped canopy and ball finial; a bell remains in situ" - RCAHMS (Royal Commission on Ancient and Historic Monuments in Scotland). Digital images are available from Kevin Byrne: church exterior, interior and the belfry - a wide selection of images showing the demounting of the belfry and the structural faults revealed.